One key aspect of connecting with learners of the modern digital age concerns what to do about homework. While the debate about its significance rages on in education circles across the globe, we seem to agree (for the time being, at least) that it is still necessary. That said, many teachers are scrambling to find homework alternatives that not only measure understanding and reinforce learning, but provide the type of appealing challenge and engagement our learners expect in school. Purpose—It should have a goal, and not just be busywork. Differentiation—Everyone is at a different level and assigning the same thing to everyone is not helpful. Repetition and rehearsal—These are mainstays of sports and music regimens and should be with other subjects. "Rather than simply a list of alternatives to homework, it instead contextualizes the need for work at home. It does this by taking typical classroom situations—the introduction of new material, demonstrating a procedure, etc.—and offering homework alternatives to traditional assignments." 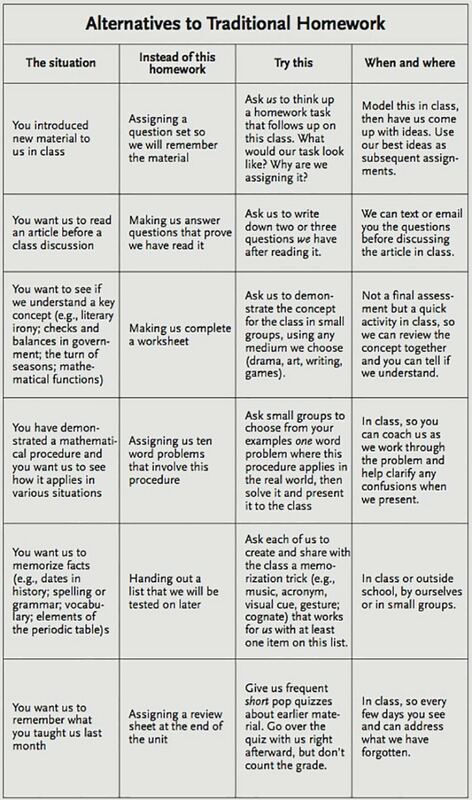 When considering homework alternatives like the ones below, we may need to rethink both the purpose and the method. In the end, perhaps it's deliberate practice, and not assessment, that the whole idea of homework should be about. The assessment factor comes naturally as our learners work through their own process of self improvement. Enjoy the chart, and allow yourself to be inspired by Cushman's clever recommendations. Keep the fire of learning alive.